The earliest mention of the Cryptic Rite in Canada is to be found in the City Gazette published in Saint John, NB on 13 February 1828: " A quarterly meeting of the Council of Royal and Select Masters will be held at Mason Hall on Thursday evening at seven o'clock." This Council was undoubtedly inaugurated by one Samuel Kidder, a lecturer and ritualist of ability from Massachusetts , who visited Saint John late in 1826 with authority from the Grand Master of the Grand Council of Massachusetts, established in June, 1826. Nothing further respecting this early Council has since been discovered and the names of early members are unknown. A tradition persists that this Council held quarterly meetings until 1837 when a fire destroyed its records. In 1866, the Hon. Robert Marshall of Saint John received the three degrees of the Rite in a Council of R. & S.M. at Baltimore with the view to establishing the Rite in Canada. Saint John Council # 1 lost its charter and property in the Great Fire of 20 June 1877, and became dormant from that date until 12 February 1892, when the Council was revived by the surviving members with William B. Wallace as TIM. It has continued to be on the active role of Grand Council to this day. New Brunswick Council # 2 also lost its records in the Fire of 1877, but was revived in 1894 and continued until 1902 when it amalgamated with Saint John # 1. Carleton Council # 3 although with a small membership continued to hold its meetings in Saint John West into the twentieth century. It has since gone into darkness. On 15 August 1867 the representatives of the three Councils formed the Grand Council R. & S. M. of New Brunswick with the Hon. Robert Marshall as the first Grand Master. Chebucto Council # 4; Halifax 18 July 1870. After a period of dormancy this Council was revived in 1899, continuing until 1910. It again became inactive but was revived in 1928 and continues to be active. Shekinah Council # 5; Orillia, Ontario, 22 November 1870. Has since become dormant. Adoniram Council # 6; Toronto, Ontario, 13 January 1871, currently Adoniram # 2, Grand Council of Ontario. Harrington Council # 7; Galt, |Ontario, 1871. Now dormant. Moncton Council # 8; Moncton, NB, 18 August 1871. Became dormant circa 1910. Zabud Council # 9; Brantford, Ontario, 1871. Now dormant. St. Stephen Council # 10; St. Stephen, NB., 1871, active until 1904, revived in 1924, now dormant. On 24 July 1871 with the approval of the Grand Council of New Brunswick the Grand Council of Ontario was formed with jurisdiction over the Councils in Ontario. The period 1875 to 1890 was marked by little activity due in part to the Great fire in Saint John, NB in 1877, the business depression of the period, a lack of candidates and the optional nature of the degrees. However, Companions David R. Monroe and John V. Ellis of Saint John continued their work both in Carleton Council and the Grand Council of Ontario. During the period Companion W.D. Gordon of Fredericton was appointed Inspector General for the Eastern Provinces. In 1880 the Grand Council of Ontario proclaimed itself the Grand Council of the Dominion of Canada with jurisdiction over all Councils of the Cryptic Rite, all Conclaves of the Order of the Red Cross of Constantine and all Lodges of Royal Ark Mariners of Canada. In 1885 it agreed to confine its jurisdiction to only the Cryptic Rite. In January 1892, the Grand Council of New Brunswick was reorganized and reconstituted with Companion John V. Ellis as M.P.G.M. and Companion Robert Marshall as Grand Secretary. The Grand Council has continued to meet yearly since that date. In 1899 it changed its title to "The Supreme Grand Council of the Cryptic Rite of the Maritime Provinces and Quebec with jurisdiction over Canada excepting Ontario and also over Newfoundland." In 1922 the Grand Council of Canada which had become dormant was revived and affiliated with the General Grand Chapter of the United States and became recognized as a Grand Council in 1925. Dissatisfaction with the name of the Council continued in the Grand Council of the Maritime Provinces and Quebec until 1929 when in accordance with an agreement negotiated between the two Grand Councils, the Grand Council of Canada in Ontario adopted the name of the Supreme Grand Council of the Western Jurisdiction of Canada R. & S.M. and the Supreme Grand Council of the Maritime Provinces and Quebec became the Supreme Grand Council of the Eastern Jurisdiction of Canada R. & S.M. The boundary line agreed upon was the provincial boundary dividing Ontario and Quebec. A proposal by the Western Jurisdiction to merge the two jurisdictions into one for the whole of Canada was declined by the Eastern Jurisdiction in 1934. In the meantime Orient Council # 16 was established at Guysborough, NS in February 1934. 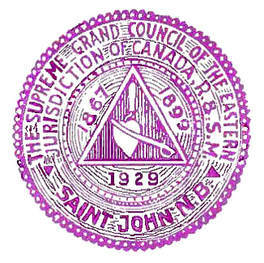 1867 - Grand Council Royal & Select Masters of New Brunswick was formed with Robert Marshall as the first Grand Master. 1929 - the current title of the Supreme Grand Council Eastern Jurisdiction of Canada Royal & Select Masters was adopted. The reference to Saint John, NB points to the source of our beginnings. On 10 May 1938, the six councils west of Ontario meeting in Edmonton, AB formed the Grand Council R. & S. M. of Western Canada. These six councils had received their charters from the previous Grand Council of Western Jurisdiction, which in 1938 agreed to change its title to Grand Council of Royal and Select Masters in the province of Ontario.